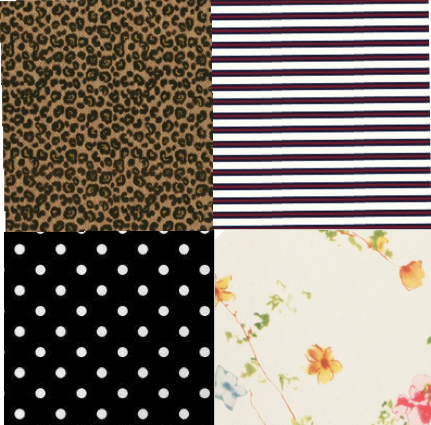 My 4 favorite designs - SweetTartStyles. 1.) faux cheetah print: It's so classy on small pieces, and it's my favorite detail item. I love to use it for scarves, flats, heels, jewelry, or handbags. This is not a design to go all out full matching, just small little hints to make it a statement. 2.) stripes: It's probably hard to find someone who doesn't enjoy a striped piece in there closet. This print is my favorite on tops. I love it especially on 3/4 length sleeve tops, so classy and sophisticated. 3.) polka dots: Black n' white polka dots allows us adults to have that fun kid feeling but adult like. Polka dots are great on light sweaters or skirts, even on delicates like bras and underwear. Lately even cute on harem pants and flats!